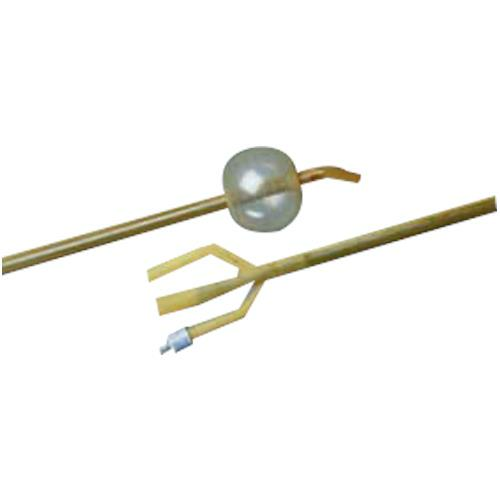 Bard Bardex Lubricath Three-Way Hematuria Foley Catheter With 30cc Balloon Capacity is used for post-turp hemostasis. Its shaft is reinforced with a wound nylon coil that offers significant resistance to collapse under the vacuum of irrigation. The additional strength of the coils assures users that any blockage can be cleared by irrigation. Item 2557H22 is backordered from the manufacturer and will ship once it becomes available. Coils add resistance to any collapse from the pressure of inflation. - If the balloon does not deflate, reposition the patient. Do not use ointments or lubricants having a petrolatum base. They will damage the catheter. Inflate the balloon with sterile water to the volume stated on the inflation lumen of the catheter by using a water-filled Luer tip syringe. Do not exceed recommended capacities.